In this wide-angle view, the Vela pulsar and its pulsar wind nebula are seen against a background of clouds, or filaments, of multi-million degree Celsius gas. 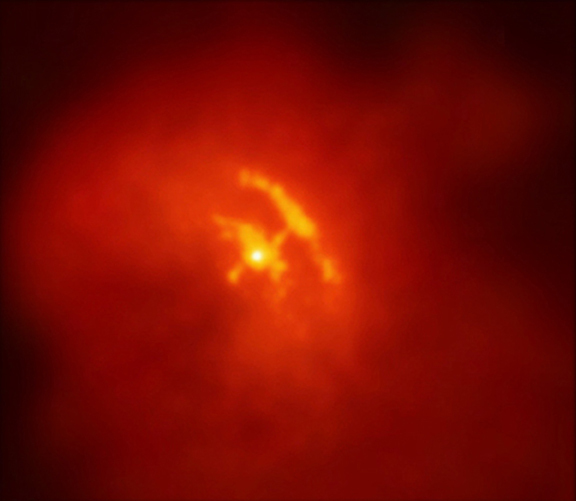 These clouds are part of a huge sphere of hot expanding gas produced by the supernova explosion associated with the creation of the Vela pulsar about 10,000 years ago. As the ejecta from the explosion expanded into space and collided with the surrounding interstellar gas, shock waves were formed and heated the gas and ejecta to millions of degrees. 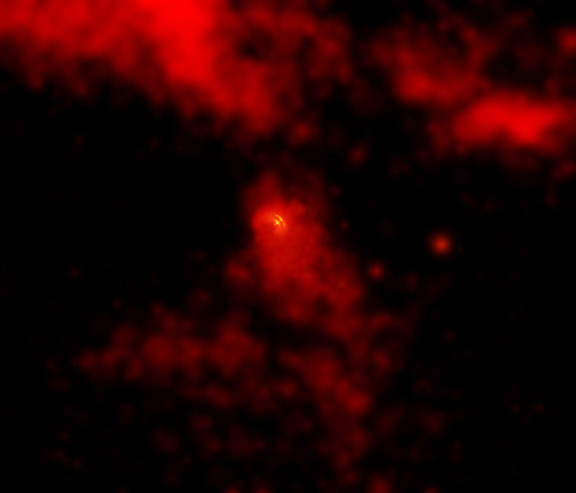 The sphere of hot gas is about 100 light years across, 15 times larger than the region shown in this image, and is expanding at a speed of about 400,000 km/hr. The Vela pulsar, located in the center of the image (yellow), is considered to be one of Chandra’s most tantalizing images to date. It reveals a striking, almost unbelievable, structure consisting of bright rings and jets of matter. Such structures indicate that mighty ordering forces must be at work amidst the chaos of the aftermath of a supernova explosion. Forces can harness the energy of thousands of suns and transform that energy into a tornado of high-energy particles that astronomers refer to as a "pulsar wind nebula." The supernova that produced the Vela pulsar and supernova remnant must have appeared extraordinarily bright on Earth, some 50 times brighter than Venus. Since no records of the event are known to exist, one can only imagine what Neolithic people must have thought of it. Scale Image is 30 arcmin across. Coordinates (J2000) RA 08h 35m 20.70s | Dec -45° 10´ 35.70"